This is yet another of Master Box's interesting sets. This one continues with their various bicycle kits. 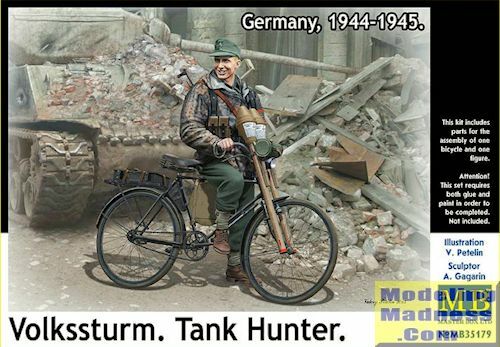 In this case, the subject is a member of the Volkssturm with a pair of panzerfausts hanging on the front forks. The kit has three sprues, one for the nearly complete bicycle, one for the rider and one for the weapons and other bits. There is also a photo etch fret for the bicycle that includes the wheel spokes, chain assemby and the various braces for the fenders. The painting guide is on the back of the box and provides a number of different paint lines from which to choose.